Overcast. High near 50F. Winds NW at 10 to 20 mph..
Overcast. Low 39F. Winds N at 10 to 20 mph. Rockford, IL -- Marge Henning, age 91, passed away on January 23, 2019. Margaret Andrea Larsen was born on September 26, 1927 in Peoria, IL. She considered Peoria her hometown, living there until her family moved to Janesville, WI, in the 1940's. Her mother was Cornelia Keith of the Elbridge Gerry Keith family of Chicago. Her father was Cleon Morris Larsen of Neenah, WI. In her youth, Marge and her brother, John Larsen (d. 2013), spent their summers on an island in northern Wisconsin, owned by the extended Keith family. Keith Island and the close family ties continued to be a major part of Marge's life until her recent death. After moving to Janesville and attending Janesville Senior High School, Marge met and later married Kenneth Louis Henning on March 28, 1947. Ken preceded Marge in death, March 1994. They had four children: Chuck is married to Lorraine Toppe, Susan is married to Larry More, John is married to Kimberly Nelson, and Martha is married to Paul Sewell. While living in Janesville, the family was active members of the Trinity Episcopal Church in Janesville. Marge was a caring and loving wife and mother to us all. She and Ken had seven grandchildren; and two great-grandchildren. Her passion for theater started in her youth, and she enjoyed the arts her whole life. During the 1950's, Marge was very involved with the Janesville Little Theater group, as they held performances on the stage of the Janesville Public Library. 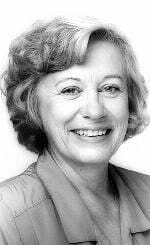 After moving to Rockford in 1967, she maintained her connections in Janesville, and participated in many Rockford productions as an actor, director, and drama teacher. Marge enjoyed acting at several area venues like Rock Valley College, New American Theater, Clock Tower, Rockford College summer stock, and the Goodman in Chicago. She volunteered in public schools, was an active member in the Episcopal Church, volunteered with programs to help people with economic needs including Jubilee program at Emmanuel Episcopal Church, the Arts Council, Rockford Dance Council, and the USA Bicentennial Committee (1976). At 91 years, she still liked to participate and help. During her life, Marge was an energetic, caring, compassionate, independent person, and she loved a bit of silly or whimsy. Memorial service will be 11 a.m. Saturday, February 9, 2019 at Emmanuel Episcopal Church, 412 N. Church St., Rockford, IL 61103. Visitation from 10 a.m. until time of service. If you wish, in lieu of flowers, please make donations to Emmanuel Episcopal Church, in the memory of Marge Henning. Arrangements by Fitzgerald Funeral Home & Crematory, 3910 N. Rockton Ave., Rockford IL. - Send online condolences at www.fitzgeraldfh.com. If you would like to submit an obituary, please view our guidelines, deadlines and contact information.